This course covers the basics of financial and managerial accounting. The course teaches participants how to record data in line with reporting requirements and how to analyze balance sheet information. The second part of the course will focus on how to interpret a company's internal methods of costing goods and services from a managerial perspective. A variety of manufacturing and service industries will be studied to provide insight into accounting systems that provide the best match for each company in terms of its field, competitive standing and multinational setting. Meet Dr. Lazer and hear more about this course. This course deals with the understanding and application of contemporary concepts and techniques for formulating, analyzing, and making decisions in the face of uncertainty. Techniques studied build on the fundamental concepts of probability, statistics, and decision analysis, with the objective of extracting decision information from data. Case studies and actual databases are used in conjunction with appropriate interactive software to develop and apply methodology for analyzing, modeling, and solving management problems. This course, a synthesis of micro and macro economics, develops a high level of knowledge regarding the contribution economic theories make to understanding the strategic behavior and the nature of economic organizations. An understanding of the economic fundamentals that drive efficiency, effectiveness and competitive advantage is essential for managers, particularly in turbulent times. The microeconomics portion of this course focuses on behavior in the marketplace studying consumers, produces, middlemen, price makers, and price takers. The macroeconomics portion seeks to understand phenomena such as inflation, unemployment, interest rates, macroeconomic fluctuations, and government policies including taxes, government spending, deficits, and monetary policy. Before the residency, you will learn the basics of microeconomic and macroeconomic theory by reading the assigned textbook chapters, viewing the provided lecture videos, and submitting your answers to four homework assignments. Our time on campus will be spent on advanced topics in discussions, class experiments, and case study analysis to study how current (but not new) economic conditions influence the kinds of business decisions you make. The primary objective of this class is for you to learn to think more like an economist. The specific topics that we cover are less important than the principles that guide how an economist views the world. The best way to learn to think like an economist is to practice. 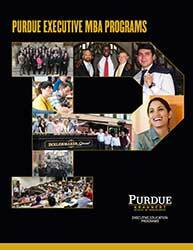 Meet Krannert Associate Professor of Economics Kevin Mumford and learn more about this course. This course provides a solid foundation in (and overview of) the area of Organizational Behavior (OB), with particular emphasis on what practicing managers need to know about managing human capital in organizations. Specific topics include (but are not limited to) the importance of strategic and evidence-based approaches to managing and making decisions about human capital, promoting effective group and team dynamics, understanding and developing leadership in organizations, understanding and managing organizational culture and ethics, and managing organizational change. Marketing has been defined as "a social and managerial process by which individuals and groups obtain what they need and want through creating, offering and exchanging products of value with others." It is a business function that identifies unfulfilled needs and wants, defines and measures their magnitude, determines which target markets the organization can best serve, decides on appropriate products, services, and programs to serve these markets, and calls upon everyone in the organization to "think and serve the customer." The course is designed to give the participant the maximum involvement in the broad sweep of marketing activities, functions, and problems. The main focus is on decision making within the context of marketing functions. Meet professor Allred and learn more about this course.